In first pAsuram – Looking at emperumAn who is having the qualities of being the creator etc of universe, highlighting his puNdarIkAkshathvam (having lotus eyes) etc, explains the nature of the personality who is to be surrendered. In first pAsuram – AzhwAr says apyaya (deluge) followed by srushti (creation) is under bhagavAn‘s control. See nanjIyar‘s introduction. Is he not talking about saulabhyam (simplicity)? Why is he talking about parathvam (supremacy)? – When the supreme lord who is greater than everyone, minimizes his stature [voluntarily], it counts as a [auspicious] quality. If a simpleton is in an inferior position, it is natural [there is nothing great about it]. emperumAn has lotus-like reddish beautiful eyes; at the time of deluge he drew all worlds inside him. After the deluge at the time of re-creating, he, with distinguished three forms of brahmA, vishNu and Siva, with himself as raw material, created earth and the upper regions, as well as residents of such places such as humans, celestial beings, animals and plants, five great elements [earth, water, fire, air, ether] and mahath etc (which are primary elements of creation). Being honest, he surrounded [permeated] all created objects; being embodiment of radiant knowledge in the form of sankalpam, appearing with inclination to create all these aforementioned objects, he created them. Further, he remained with abundant divine radiance. mUvar (three personalities) can also indicate brahmA, rudhra and indhra. seyya thAmaraik kaNNanAy – As said in Sruthi (vEdham) and smrithi – chAndhOgya upanishath 1.6 “thasya yathA kapyAsam puNdarIkam EvamakshiNI” (The two divine eyes of SrIman nArAyaNan who is parabrahamam, resemble a lotus flower that was blossomed by morning sun’s rays) and SrI vishNu dharmam 22 “yagyESO yagyapurusha: puNdarIkAksha samgitha:” (being the lord of sacrifices, being yagya personified, having the name of puNdarIkAksha), one who is having divine eyes which resemble fresh lotus flower which just blossomed. ulagEzhum … – Like the lotus eyes for beauty [which is distinct and special], praLaya Apathsakathvam (protecting during deluge) is [the highlight] in [his] qualities. vaiyam … – vaiyam – bhUmi (earth); vAnam – higher planets. manisar – residents of earth. dheyvam – residents of higher planets. maRRum – animals and plants. Second maRRum – the five great elements which are the initial phase of variegated forms [such as humans, celestial beings, animals, plants]. Third maRRum – mahath (the great) which is the initial phase of five great elements. muRRum – all the aforementioned objects. To say “one who appeared as embodiment of radiant knowledge to create everything”. Alternatively – As said in thiruvAimozhi 8.10.7 “thanimAppugazhE engyAnRum niRkumpadiyAyth thAnthOnRi” (appearing himself as brahmA, with his glories standing firm forever showcased in vEdhAntham) and in thaiththiriya upanishath “bahu syAm” (let me become many), to create everything, he appeared as them and created them. In this alternative point of view, veLippattu means he appeared with inclination to create. seyya – seyya (sevvai) for gyAnam is being effortless. Alternatively – sevvai means as said in thaiththiriya nArAyaNa upanishath “dhAthA yathA pUrvamakalpayath” (brahmA [with bhagavAn as antharyAmi] created everything as it were before), honestly creating all creatures based on their previous karma. sUzh – pervading all the objects that are created. sudar – Well expanded as stated in thiruvAimozhi 3.1.9 “mazhungAdha gyAnam” (unfailing knowledge). gyAnamAy – one who is having such knowledge in the form of sankalpam (vow/will). veLippattu ivai – These which are revealed from pramANam (authentic source). With this, bhagavAn‘s jagath kAraNathvam (being the creator/cause of universe) is explained. Further, his being together with nithya vibhUthi (spiritual realm) is explained. pinnum … – Beyond being together with leelA vibhUthi (material realm), as said in mahAbhAratham AraNya parvam “athyarkAnaladhIptham thath sthAnam” (SrIman nArAyaNan’s divine abode parampadham is many thousands of times more radiant than the sun and moon), this explains bhagavAn‘s abundantly radiant presence with nithya vibhUthi. moy koL sOdhi – Also explained as one who is having auspicious qualities such as thEjas (radiance). thEjas is a sample for all of his qualities. Why are his qualities spoken about now? That is because, one who is abundant with auspicious qualities, is to be accepted as refuge. oru mUvarAgiya mUrththiyE – sarvESvaran who is creating/annihilating by being the antharAthmA (in-dwelling super soul) of the bodies and souls of brahmA and rudhra, and performing the sustenance himself. The word “mUrthi” denotes supremacy. Alternatively, mUvar (trio) indicates brahmA, rudhra and indhra. 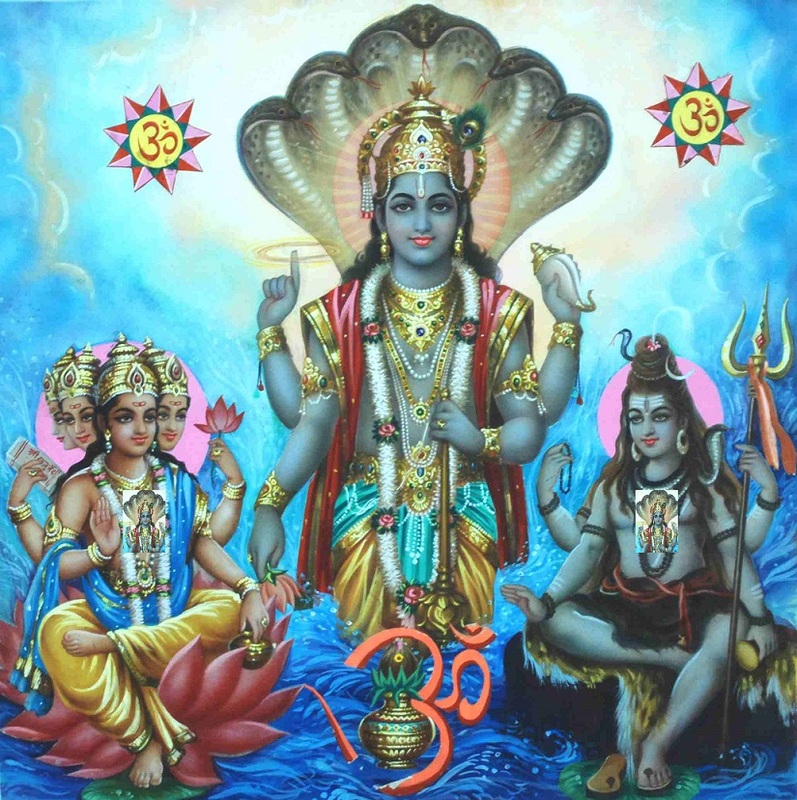 This pAsuram should be read as “The supreme lord with abundant radiance and who became the trio – further – appearing as everything such as earth, higher planets, humans, celestial beings, animals, planets, five great elements, primary matter – with fully pervaded radiant knowledge – reddish lotus-eyed lord who consumed all the worlds – created them – this being the case, surrender unto him”. This entry was posted in thiruvAimozhi, thiruvAimozhi 3rd centum on September 13, 2016 by Sarathy Thothathri.